Arts Gumbo 2012 presents three Latino cultural programs in September, October and November featuring music, dance and food of Cuba, Brazil and Argentina. This family series takes place at the Rainier Valley Cultural Center, 3515 S Alaska St in Columbia City. 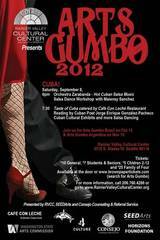 On Saturday, September 8, Arts Gumbo: Cuba! starts at 6 pm with the deep-grooving salsa music of Orchestra Zarabanda, a salsa dance workshop for audiences with Maiensy Sanchez, cultural exhibits, poetry readings and food from Seattle's best Cuban restaurant Cafe con Leche! Arts Gumbo: Cuba! starts at 6 pm, Sept 8 and will feature the vibrant Cuban dance music of Orchestra Zarabanda. From the moment Orchestra Zarabanda counts off, it's a salsa dance party! Echoing the classic Cuban conjunto format, Zarabanda plays deep-grooving salsa, straight from Old Havana, and spices it up with modern arranging sensibility. This 11-piece band is comprised of latin rhythm section (Julio Jauregui-piano, Jeff Norwood-bass, Junior Medina-timbales, Tom Bergersen-congas, Steve Smith -bongó), trombones (Greg Koehler, Nathan Vetter), flute (Richard Warner) and vocals (Miguel Muñoz, Alfredo Polier, Elspeth Trejo Savani). Influences include Felix Chappotin, Miguelito Cuni, Celia Cruz, Eddie Palmieri and Los Van Van. Cuban dance instructor Maiensy Sanchez will lead a Salsa dance workshop for audience members, during and after the musical set by Orchestra Zarabanda. A pioneer of the Cuban style of dance instruction in the Seattle area, Sanchez’ teaching method draws from her stage background and her training in Cuban ballet. Sanchez has also received training in jazz, modern dance, flamenco and West African dance and has performed at the New Orleans International Ballet Conference (as assistant to master Roberto Borrell). Audience members will have the opportunity to learn a variety of Cuban dance steps with an emphasis on Salsa. At 7:30pm, Chef Pedro Vargas from SODO-located Café Con Leché will offer audiences a variety of Cuban food. Café Con Leché is Seattle’s primo Cuban restaurant and recently expanded from the Paladar Cubano truck near Greenwood to open its new space at 2905 1st Ave S. Afterwards, Cuban poet Jorge Enrique Gonzalez Pacheco will do a bilingual reading from his book Under the Light of My Blood, published in Canada in 2009, and two poems from his new unpublished book. Cuban dance costumes, instruments and textiles will demonstrate the flavor of Cuba. The evening will end with more Salsa Dancing with Maiensy Sanchez. Bring your dancing shoes! On Saturday, October 13th, Arts Gumbo: Brazil! will feature the best of Brazilian Carnaval music with internationally acclaimed Brazilian band Show Brazil!, including Samba dance workshops and Brazilian Food. On Saturday, November 10th, Arts Gumbo: Argentina! will present the elegant, passionate dance music of Tangabrazo, a Tango dance workshop for audiences along with Argentinean food. Tickets for Arts Gumbo 2012 can be purchased for $10 general; $7 seniors and students; $5 for children 2-12; and $25 for Families of Four or at the door or at www. brownpapertickets.com (search Arts Gumbo). Arts Gumbo is co-presented by the Rainier Valley Cultural Center, SEEDArts and Consejo Counseling and Referral Service. For more information, call 760-4285 or visit RainierValleyCulturalCenter.org. Funding was provided by 4 Culture, the Tulalip Tribes, Horizons Foundation, and the Washington State Arts Commission.